The Minneapolis-St. Paul International Airport is ready for the Super Bowl 52 fans to arrive – and leave . “For many Super Bowl attendees, Minneapolis-St. Paul International Airport will be their first and last impression of Minnesota, and we want to ensure it’s a great one,” said Brian Ryks, executive director and CEO of the Metropolitan Airports Commission, which owns and operates MSP. Weather contingency plans are in place. Airport police and fire crews have been working with city, county and federal law enforcement agencies on how to deal with various scenarios. And the Transportation Security Administration is bringing in extra officers and passenger screening canines to help process passengers heading home after the game. “We have a solid plan in place to keep everyone safe, the operation running smoothly, and travelers’ experience positive,” said MSP’s Ryks. A 10-day “Performing Arts Spectacular” is underway, with a lineup of events featuring everything from Bollywood, hip-hop and flamenco dancers to vocal and drum performances. The airport’s animal ambassadors will be out in full force. And giveaways in the terminals will include a series of Super Bowl/Winter-themed MSP buttons and foldable terminal maps with disposable hand warmers attached. In addition to the extra flights, American Airlines, the official airline for the Philadelphia Eagles, is handing out Eagles rally towels to all passengers flying on from Philadelphia to Minneapolis-St. Paul through Sunday, February 4. Everyone in Seattle is pretty worked up about the Seahawks return to the Super Bowl. So it was no surprise that more than 80,000 Alaska Airlines Mileage Plan members from Oregon, Washington and Alaska (20 percent more than last year) entered a contest to win a spot on a special charter flight to Phoenix for a Super Bowl party on February 1. MVP Gold members could also bid miles – which would be donated to Children’s Hospital in Seattle. The 56 contest winners – and their guests – along with 6 top mileage bidders (who bid a total of 2.2 million miles!) – enjoyed an inflight tailgate party to Phoenix and will be cheering on Russell Wilson, Alaska’s ‘Chief Football Officer’, and his team Sunday evening. Here are some photos from the flight. Alaska Airlines’ check-in area welcomes Seahwawks fans – known as 12s. Ed Young and Nancy Douglas from Sitka, Alaska were especially pleased to be on this flight. Both are cancer survivors and Nancy’s last chemo session is next Wednesday. Julie & Tom Rash bid 390,000 miles – which go to charity – to be on the flight. Who wouldn’t want their photo taken with this Russell Wilson?? Trying to find a flight to Phoenix, Arizona that will get you there in time for Super Bowl XLIX on February 1st? Many regularly-scheduled flights are already sold-out, but airlines are adding special flights to their schedules to help fans get to the game. Alaska Airlines has added two extra round-trip flights between Seattle and Phoenix; one on January 30th, the other on February 2nd. 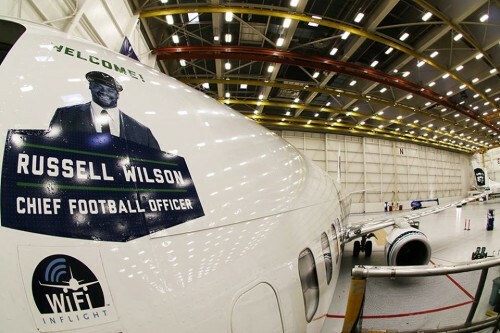 The airline is also hosting Russell Wilson’s Fan Flight II: 56 lucky contest winners will be able to take a friend on a special flight from Seattle to Phoenix to attend a Super Bowl party. To enter you’ll need to be an Alaska Airlines’ Mileage Plan member and be a resident of Oregon, Washington or Alaska. United Airlines is adding flights – 55 in all – from its hubs in Chicago, Denver, Houston, Los Angeles, Newark and San Francisco and adding nonstop service – from Jan.29 to Feb. 2 – from Boston and Seattle to Phoenix. Delta Air Lines is adding service between Phoenix and Boston, Los Angeles and Seattle for Super Bowl fans. JetBlue is adding a flight from Boston to Phoenix on January 30th and a return flight on February 2nd. Southwest Airlines is adding both nonstop and connecting flights between Seattle and Phoenix Sky Harbor and between Boston and Manchester (New Hampshire) and Phoenix between January 29 and February 2. US Airways is adding extra flights as well. Sunday was a big day for football fans (especially fans of the Seattle Seawhawks and the New England Patriots, of course) and airlines are helping get the celebrations for Super Bowl XLIX underway. For those who want to make quick plans to go the game, JetBlue is adding extra flights between Boston and Phoenix. In addition to the regular schedule of flights (already sold out), JetBlue is adding a flight leaving Boston on January 30, 2015 at 8:20 a.m. (arriving at 12:24 p.m.) and returning on February 2, 2015 at 11:30 a.m. (arriving at 6:10 p.m). And early Monday Alaska Airlines announced a re-run of last year’s sweepstakes offering Mileage Plan members a chance to fly from Seattle to Phoenix on a special charter on Feb. 1. “Russell Wilson’s Fan Flight II – For Strong Against Cancer,” a four-day sweepstakes is taking place on Alaska Airlines’ Facebook page. Fifty-six prize winners will receive two round-trip tickets for an ‘inflight tailgate party’ from Seattle to Phoenix on its “Go Russell 737-900ER” aircraft. Winners will also get two nights of hotel accommodations, admission to an exclusive game day party and transportation to and from Phoenix Sky Harbor International Airport and their hotel. On Jan. 30 flights will head from Seattle to Phoenix at 1:30 p.m. and 5:55 p.m. and on February 2nd from Phoenix to Seattle at 5:55 p.m. and 10:25 p.m.